This page is about the Arizona, US, town. For other uses, see Carefree (disambiguation). Welcome to the town of Carefree Marker . Motto: "The Best Small Town in Arizona"
Characterised as an upscale residential area, Carefree was conceived in the mid-1950s by business partners K.T. Palmer and Tom Darlington as a master-planned community. Land sales commenced in 1955 and homebuilding started in 1958. 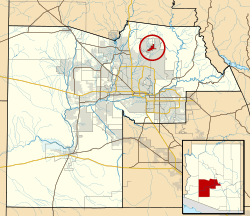 Carefree was incorporated in 1984 to avoid annexation from neighboring Scottsdale. Carefree has a hot semi-arid climate (Köppen BSh) with hot summers and mild winters, avoiding arid designation by being located closer to the rain-catching central mountains of Arizona, so that it receives about 70 percent (around 5.3 inches or 135 millimetres) more rainfall annually than does Phoenix. There are 141 afternoons annually with highs of at least 90 °F or 32.2 °C, 63.4 afternoons of at least 100 °F or 37.8 °C, and three afternoons that exceed 110 °F or 43.3 °C. During the winter, 8.3 mornings will fall below freezing; the coldest temperature reported in Carefree is 15 °F or −9.4 °C, which occurred on January 13 of 1963 and January 7 of 1971. Snowfall is extremely rare with only four occurrences since 1962 and no measurable snow since April 2 1999 when the settlement saw its latest freeze on record; the most snow on record is 2.3 inches or 0.06 metres during March 1973. Rainfall, however, is sometimes heavy during winter fronts or monsoonal storms; the wettest month on record is January 1993 with 9.37 inches (238.0 mm), which helped produce a record “rain year” total of 26.20 inches (665.5 mm) between July 1992 and June 1993; in contrast between July 1962 and June 1963 only 6.98 inches (177.3 mm) was recorded. The Carefree Town Hall located at 8 East Sundial Circle. In the town, the population was spread out with 12.7% under the age of 18, 2.0% from 18 to 24, 15.4% from 25 to 44, 40.5% from 45 to 64, and 29.3% who were 65 years of age or older. The median age was 55 years. For every 100 females there were 98.6 males. For every 100 females age 18 and over, there were 97.2 males. Carefree, Arizona Facts for Kids. Kiddle Encyclopedia.